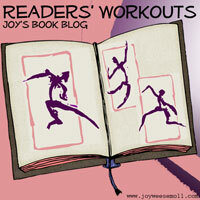 Reader's Workouts is a weekly event which is hosted over at Joy's Book Blog. I've been slacking in my attendance at the gym. Without someone to go with me, I find I can easily talk myself out of going. This week my friend and gym buddy went back to her school schedule which means we can get to the gym together on Tuesdays. In my book, one day is better than no days. My goal for this week is to not talk myself out of going to the gym on Thursday. I find I need the treadmill to get a good walk in, otherwise I find a walk around the block turns into a slow meander while I listen to my audiobook. I love this podcast and sadly over the spring/summer I fell behind in listening. I caught up and only have to listen to the new episode that came out Monday. So Thursday, I'm going to have to start a new audiobook and I have no idea what to listen too. I currently have a number of books waiting to be heard on my audible account. I don't know which to choose first. Hope your week is going good! I love listening to audio books while I walk on my treadmill! I'm starting Fatal Catch by Roxe Anne Peacock tomorrow. I'm still working my way through podcasts. I ended up subscribing to a few more the last few weeks (I don't know why) so those have been keeping me company on my 'walks'. Nora Roberts Reading Challenge - A Call for Help! Austen in August Mini Reviews - The other books!